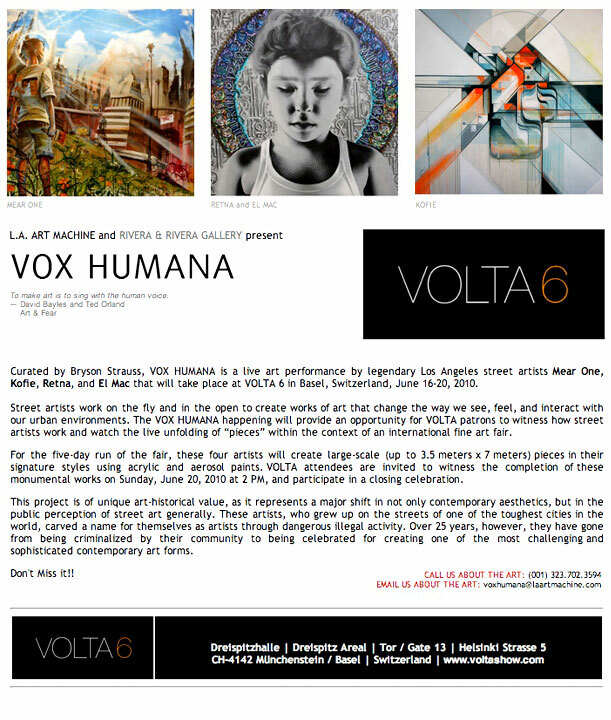 L.A. ART MACHINE and Rivera & Rivera Gallery are proud to present, VOX HUMNANA at Volta6, Basel. Curated by Bryson Strauss, VOX HUMANA is a live art performance by legendary Los Angeles street artists Mear One, Kofie, Retna, and El Mac that will take place at VOLTA6 in Basel, Switzerland, June 16-20, 2010.Street artists work on the fly and in the open to create works of art that change the way we see, feel, and interact with our urban environments. The VOX HUMANA happening will provide an opportunity for VOLTA patrons to witness how street artists work and watch the live unfolding of “pieces” within the context of an international fine art fair. For the five-day run of the fair, these four artists will create large-scale (up to 3.5 meters x 7 meters) pieces in their signature styles using acrylic and aerosol paints. VOLTA attendees are invited to witness the completion of these monumental works on Sunday, June 20, 2010 at 2 PM, and participate in a closing celebration.